No current Community Outreach Sit & Sew dates planned. If you are interested in hosting a get together please speak to Carol DeSantis! Thank you! Creating fun and creative items for the QUILT SHOW BOUTIQUE!!! * Plan to bring your sewing machine and standard sewing supplies. Carol will let us know if anything special is needed. She has lots of patterns and kits and fabric already but she needs your help to make it all come together! Our Quilt Show Boutique is an important fund raiser for the guild. ​The guild members made a total of 103 quilts in 2018. We donated 94 quilts, 56 to the Greensboro Police Department (The Family Justice Center) and 38 to the Red Cross (for those effected by our April 2018 tornado). We also sold 7 quilts at the Persimmon Festival so we could purchase batting and backing fabrics for our next year of quilt donations. The guild made and donated 47 tote bags for the homeless to the IRC (Interactive Resource Center). If you'd like to make a bag the pattern is below to the left. Be sure to use sturdy fabrics. Or you can pick up a kit at the next guild meeting. We also donated 50 fleece hats and 3 fleece throws to The Alight Foundation for chemo patients. We have lots more fleece so we'll make more as soon as we can! If you would like to volunteer to host the Sit & Sew (between 6 and 10 people) at your home, church or community club house please contact Carol DeSantis as soon as possible. 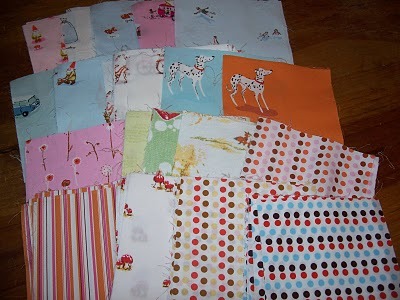 At our Sit & Sew gatherings we will be sewing on projects for the various charities that PQG supports. Please feel free to bring your own future charity quilt or try new projects planned for the session. Please bring all necessary sewing supplied and your machine (don't forget your machine's cord!). Charity quilt kits, block sets and coordinated fabrics kits will be available at each guild meeting for you to take home, piece, quilt, bind and return. See Carol DeSantis and Debbie Walsh at the Community Outreach table each meeting! * Make blankets from NEW, CLEAN, WASHABLE materials in infant, child, or teen friendly colors. Remember, these blankets are meant to be colorful, cheerful, and cuddly. Wash and iron fabrics to remove sizing which can cause allergic reactions. * Crochet, knit, quilt, or tie your blankets - or finish the edge on single layer polar fleece. * Make blankets from 100% cotton fabric, flannel, polar fleece, or acrylic yarn. Thread should be cotton, cotton wrapped, or polyester. NO MONOFILAMENT thread. * Secure the batting into outer seams and if the blanket is tied, please anchor it every 4-6 inches, cutting ties to 1 inch or less in length. * Weave in all yarn ends on crocheted and knitted blankets. * Check your blanket carefully for straight pins. It's better you find that pin and not the child who receives your blanket. * Don't make your blankets out of tapestry, burlap, upholstery fabric, 70's type double knit, felt, vinyl, wool, holiday fabric or wool yarn. * Don't attach buttons or decorative items to a blanket. They can be a choking hazard. ​* Don't use thick fabric paint on the surface of your blanket. Use ONLY permanent fabric markers made specifically for fabric when coloring on muslin. * Don't use wool or wool-blend yarn. * Blankets that smell of smoke or strong chemicals (including perfumed fabric softeners), or have pet hair on them cannot be accepted as they produce severe allergic reaction in the children. Unfortunately, washing these blankets does not always remove the problem. Please use a lint brush or roller on your blankets if they are covered with thread or lint. * Another word about pins ... PLEASE check, double check and triple check your blankets for straight pins. Crocheted or knitted baby blankets - 30" x 30" or 30" x 36" using soft pastel baby yarn (no smaller please). Use patterns with a tight gauge to prevent large holes. No wool or wool blend yarn, acrylic, or polyester only. For child sizes - choose child friendly colors. Quilts - Child - 36" x 45" or 40" x 54" to 60" Teen - 45" x 65" to 70"